Aquarius women are an exciting blend of mischief and deep thoughts. If you’re looking for mental stimulation, fun and sexiness in one package, then this is the girl for you. Unpredictable, broadminded and often a little "different" they are usually very intellectual and can be critcized as cold or distant by those who are more emotionally inclined, while being appreciated by those looking for an independent partner. Aquarius Woman is eccentric, unstable but creative person. She is of friendly nature and make lots of friends. She likes to go out traveling and enjoy the life. Usually stay away from getting committed to anyone and love is not the thing for her. She is funny and cheerful thus people from both the sexes get attracted to her. She likes to have her own space and can look absent to others. This nature of being independent can help her in her professional life but can create problems in love life. She is talkative and will talk with anyone she meets that is the reason she is always surrounded with people, especially men. She tends to get bored of repetitive things and loses her interest in it. She is clever and likes to study new things. 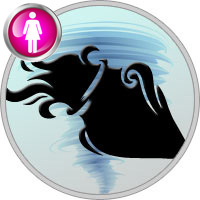 Aquarius women tend to come across as very self confident and independent in several ways. She’s unlikely to be interested in winning approval or compliments, making her often bold, non-conforming, and sometimes shocking. Many Aquarians are amused by narrow minded people, and aren’t beyond doing or saying things purely to see the reaction they get. They aren’t aggressive people per se, but they can be a little mischievous in this area! Since she’s probably not concerned as to what other people think of her, she often doesn’t bother forming opinions about other people’s behavior; a "live and let live" attitude may be evident. Along these lines she’s very unlikely to be into gossip, or to ever be petty. Aquarius woman prefers to follow her own rules and like people of same kind. She would like to have partner who is true and honest. She would analyze your behavior before committing to you. She will be more interested in her social life but you don’t have worry about her loyalty as Aquarius Woman makes lifetime relationship. She would take really long time to overcome her past relationship. She will trust you and would expect same from you. She would do her best to save the relationship in case there are some conflicts between you two. She would like to share your thoughts and feelings but you should not get upset if she is not willing to open up her mind to you. She takes long time to share her inner most secrets with her partners. She can be moody sometimes and you will have to deal with frequent swings in her mood. Aquarius-Woman and Aries-Man - make very friendly relationship. They tend to show respect and admiration to each other. Both of them like living independent lives and they always manage to keep it happier. Aquarius people may have to control their habit of living detached from Aries. Aquarius-Woman and Taurus-Man - both possess the powerful physic and enjoy their freedom. They can have good understanding between them as they both are quite equal to one another. At the same time they both may look at each other like competitors. There can be some differences in this relationship like Taurus can be too rigid sometimes while Aquarius people are innovative in nature. Aquarius-Woman and Gemini-Man - both are cheerful and friendly in nature. They both like each other’s company as they have lots of things common. Aquarius person can provide more stability to Gemini person. They both would have friendly relationship in whichever type of relations they form. Aquarius-Woman and Cancer-Man - Cancer people are kind and polite in nature while Aquarius people are friendly and outgoing in nature. Though this can help them make good bonds initially their different personalities can create problems to take their relationship further. They will need to make some compromises to sustain their relationship. Aquarius-Woman and Leo-Man - both show characteristics which are just conflicting to each other. But the same qualities can also attract them to each other and bring close to them. Leo people are often selfish but the Aquarius people are selfless in nature. Still they can maintain their relationship in decent way. Aquarius-Woman and Virgo-Man - they relationship will have to face some hitches due to differences in their characteristics. Aquarius people are of easy going nature while Virgo people are well organized in nature. Virgo’s strict nature may look harsh to fun loving Aquarius person while Virgo may feel annoying with high spirited Aquarius person. They both can learn other side of their own nature; as they both have just opposite nature of each other. With some understanding they can solve their differences. Aquarius-Woman and Libra-Man - both are good in interacting with people. This can either make them argue a lot or help solving their problem quickly. They both are also creative in nature which will help them to enjoy many moments in their relationship. They both may show moodiness and lazy personalities sometimes. Aquarius-Woman and Scorpio-Man - they can have difficulties in their relationships due to their different natures. They may also find opposite traits in each other. Scorpio prefers stable and independent life while Aquarius likes travelling and socializing. They are not the one to settle with the same thing. Aquarius-Woman and Sagittarius-Man - both are intelligent and like to research on several things. They both are freedom loving thus no one tries to control other one. They have many similarities and appreciate each other’s company. Aquarius-Woman and Capricorn-Man - they are two different sides of the coins. Capricorn believes in reality while Aquarius believes in making their future better. They may have different personalities but they both have qualities that each of them would like to posses. Aquarius-Woman and Aquarius-Man - relationship is union of two highly intuitive and intelligent people. They share same characteristics which helps them to co-ordinate with each other. They both would enjoy exploring things together and learn from it. Aquarius-Woman and Pisces-Man - relationship is little odd as former is more outgoing and unstable while latter wants to settle down. They may have some common things like brilliant minds and calm nature. With time they will grow more trust and start appreciating each other.